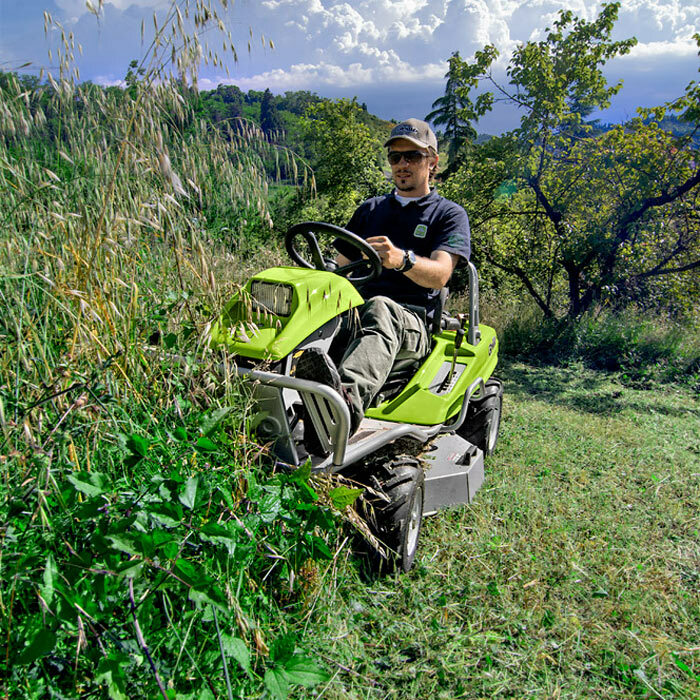 Hydrostatic brush-cutter with a single blade cutter deck with differential lock and front safety brakes, ideal for cutting high grass, bushes and shrubs on slopes and irregular ground. 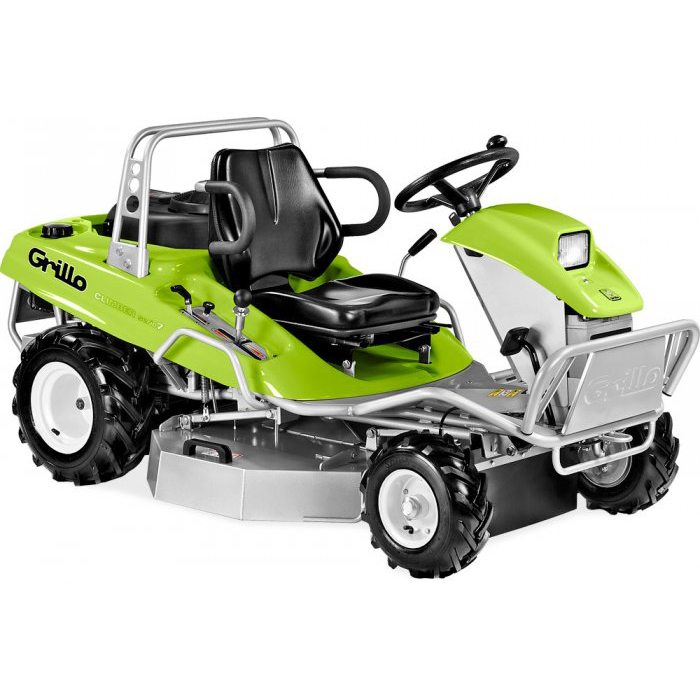 The Grillo Climber 7 can safely climb slopes and is very efficient in maintaining overgrown, neglected areas, agricultural areas and lawns. The extreme maneuverability, smooth steering and speed lets the machine work quickly and efficiently while remaining simple and easy to operate. The single-blade cutter deck has a cutting width of 85 cm. 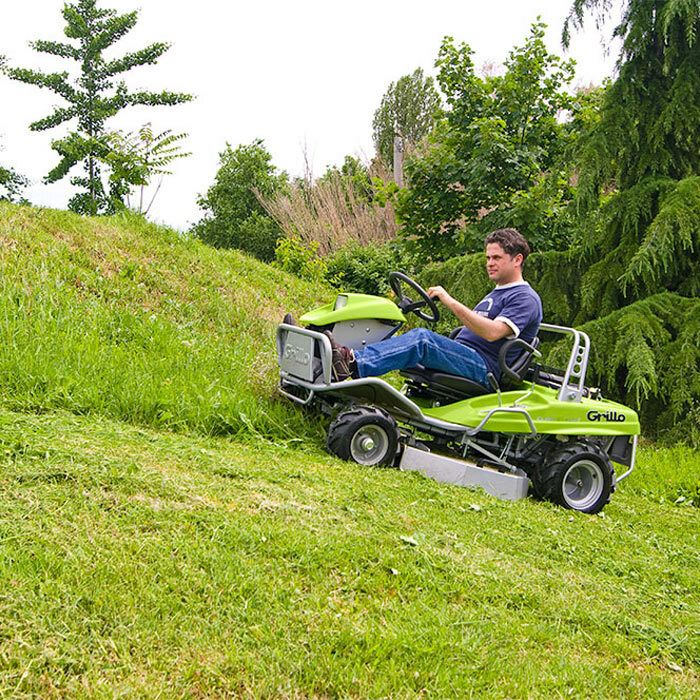 The steering radius is extremely small, only 45 cm, allowing the operator to mow in tight areas. The front axle and the tractor type tires ensure both a firm grip and traction on irregular and low-adherence ground. The Climber 7.18 has a 15.2 HP (18 HP gross power) petrol engine. Transmission consists of a hydrostatic axle with an oil cooling fan, which is necessary to improve the transmission’s performance by reducing its working temperature. The mechanical diff-lock is standard and operated via a foot pedal. This device is indispensable for working on low-adherence slopes and in the case of extremely uneven ground. Solid cutter deck front wheel, puncture-proof! Climber is a compact machine with a low center of gravity and perfect weight distribution, designed to ensure maximum stability and greater safety for the operator. Engagement of the blade is via an electric push-button situated close to the steering wheel. The cutting height ranges from 3,5 to 8,5 cm and can be selected from the seat by operating a lever giving 6 cutting positions. This lever also has a further transfer position which is used to raise the cutter deck from the ground. In this position blades are automatically disengaged to allowing you to easily drive over kerbs and other obstacles. The cutter decks belt is selfadjusting. The whole cutter deck is constantly kept parallel to the ground thereby improving the cutting quality even after many years use.